Edited by Gregory Benford and James Benford, published in August, 2013. Starship Century seeks a new place in the universe for all humankind. In this ground-breaking anthology James Benford and Gregory Benford combine their talents and celebrated intellects to bring together top scientific leaders and top science fiction writers—all focused on getting us (humans) to the next chapter in space travel, interstellar flight. 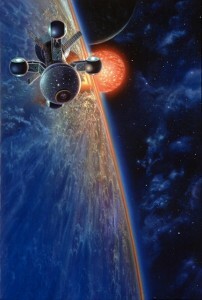 The Starship Century Anthology includes articles exploring and explaining space travel, written by leading scientists. It tells of the known and the unknown, and it features dreams and visions in science fiction by some of the top writers of our era. The Benfords push against known boundaries and take readers along with them in this intriguing compilation of science and possibility. Purchase your copy of Starship Century: Toward the Grandest Horizon on Amazon Kindle, Amazon Books, Barnes & Noble in print and ebook, Kobo and Smashwords. Starship Century is a symposium coordinated by the Arthur C. Clarke Center for Human Imagination in collaboration withGregory and James Benford, presenting ideas from their anthology of science and science fiction of a 100-year project to create a starship. Scientists address the challenges and opportunities for our long‐term future in space, with possibilities envisioned by: Stephen Hawking, Freeman Dyson, Sir Martin Rees, Paul Davies and Robert Zubrin, Science fiction authors such as Neal Stephenson, David Brin, Nancy Kress, Allen Steele, Joe Haldeman and Gregory Benford discuss the implications that these trajectories of exploration might have upon our development as individuals and as a civilization. TIMESCAPE: What a wonderful book ! Refreshing; & challenging, as well as speculatively analytic. Truly, deserves to be known, not only as fiction, but as a diarist’s concerns, on the forces, foreclosing, on our planetary future .. The characters, seem, almost recognizably real. That, is a rare gift. The book, is a gem. I look forward, to reading, the others in your listing, of works. With every kind wish, L.